It's true that Burger King serves burgers and other forms of sustenance, but the best reason to go there is to wear one of those delightful cardboard crowns. Those crowns teach you that though you traveled miles to reach the Burger King, you were the true Burger King all along. 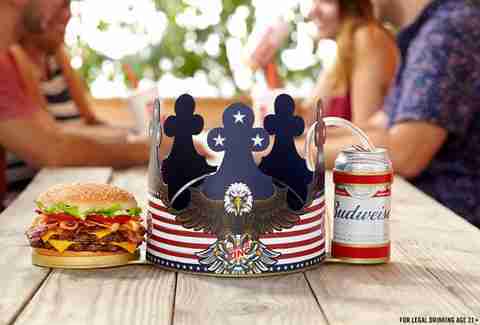 Anyway, that headgear just got even even better: There's a new crown that holds both a burger and a beer, complete with a straw. 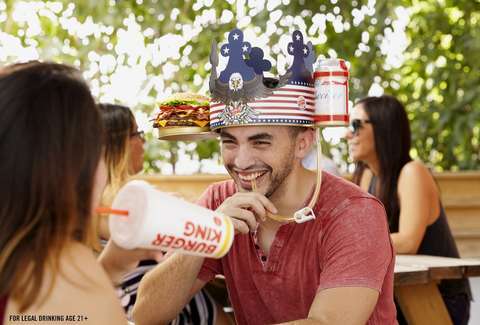 This radical innovation in headwear, available to anyone over 21, is the fruit of a collaboration between Burger King and Budweiser. In part, it's a promotion of Burger King's new American Brewhouse KING Sandwich, which is a features a quarter pound of beef, bacon, onions, something called tavern sauce (which is apparently what makes this a "Brewhouse" sandwich), American cheese, and mayo. Unfortunately, this doesn't mean Burger King is going to start handing out beer. You'll have to supply your own. The other part of this promotion is that Budweiser is updating that "Wassup" commercial. You may remember it from the Scary Movie parody, you may remember it from your uncle repeating it in place of developing a personality, or maybe you even remember the commercial itself. In any case, it's coming back and will involve the King himself. But don't let that distract from the fact that once you put on that crown, you are the true Burger King.